The Audi Q7 is a four-door, up to seven passenger luxury sport-utility vehicle. When parent company Volkswagen released their first full-sized sport-utility vehicle in conjunction with Porsche in 2003, it became clear that it was only a matter of time before Audi also joined in with a luxury SUV of its own. Four years later, the Audi Q7 made its appearance on the scene, riding on the same platform as the VW and Porsche but adopting a more luxury-oriented focus than either of the vehicles which came before it. The 2009 Audi Q7 is a very attractive SUV which combines the best elements of Audi styling with a large, upright appearance and high ground clearance. The vehicle’s clean lines help it to appear smaller than it actually is, especially when compared to the chunky styling of competitors like Infiniti. The Q7 has been designed to cram as much utility as possible inside its spacious interior. The variety of seating options are claimed to have 28 different combinations, enabling owners to haul either 5 passengers or a wide range of cargo. Audi has chosen to forgo a third row of seating in favor of moving the second row back a number of inches in order to provide greater leg room for rear passengers. The interior is of course appointed with the quality of materials typical of an Audi. Fine leather abounds, and a lack of plastic surfaces help to keep the Q7 from feeling like a truck on the inside. Drivers benefit from a camera mounted in the rear of the Q7 in order to make parking this leviathan a little bit less difficult. This system also makes it easier to mount a trailer, and given the 5,500 lb towing capacity, it is likely that there are many drivers who will use their Q7 to move boats, campers and other equipment. There are two engine options available for the Q7, and both make use of Audi’s direct-injection technology to combine excellent power with good fuel economy. The base motor is a 3.6 liter V6 which provides 280 horsepower and 266 lb-ft of torque, which can be upgraded to a 350 horsepower 4.2 liter V8. Both engines use a 6-speed Tiptronic automatic transmission to transmit power to all four wheels via Audi’s Quattro all-wheel drive system. The Q7 is primarily designed for on-road cruising, but the all-wheel drive does allow for off-road adventures should the urge arise. Electronic stability control helps keep the large SUV safe in either situation, and it even provides a special off-road mode designed to make traversing difficult terrain that much easier. This is in addition to Hill Descent Control, which keeps the Q7 from barreling down steep ridges on the trail, a useful feature for such a heavy vehicle. 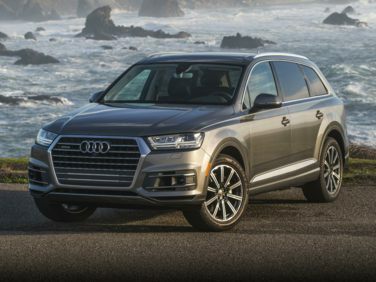 The Audi Q7 is definitely a much more handsome option than its Volkswagen Touareg cousin, and it is priced below the more performance-focused Porsche Cayenne. The Q7 is a great alternative to domestic luxury SUVs such as the Lincoln Navigator or Cadillac Escalade, and it provides comparable size, better handling and better interior luxury than either of those two trucks.